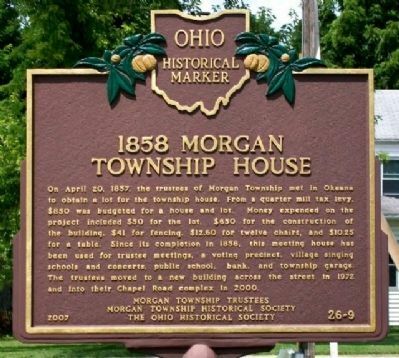 On April 20, 1857, the trustees of Morgan Township met in Okeana to obtain a lot for the township house. From a quarter mill tax levy, $850 was budgeted for a house and lot. Money expended on the project included $50 for the lot, $650 for the construction of the building, $41 for fencing, $12.60 for twelve chairs, and $10.25 for a table. 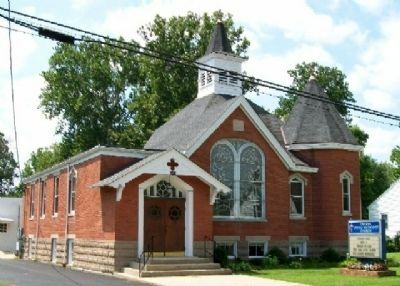 Since its completion in 1858, this meeting house has been used for trustee meetings, a voting precinct, village singing schools and concerts, public school, bank, and township garage. The trustees moved to a new building across the street in 1972 and into their Chapel Road complex in 2000.
the war. He was convicted of sedition by a military commission and exiled by the President. 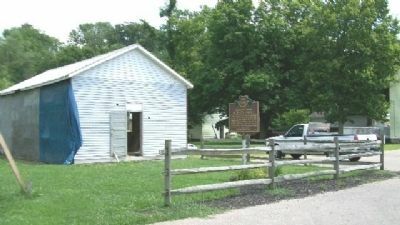 On July 17, 1863, those unfriendly to the Civil War (Copperheads) from Morgan, Ross, Reily, and Hanover townships met at the Morgan Township House to organize the Butler County Mutual Protection Company. Copperheads from Franklin County, Indiana, joined the company to protest the draft and the president's handling of the war. The company was short-lived, however, as similar antiwar organizations flourished in the region. Location. 39° 20.888′ N, 84° 46.006′ W. Marker is in Okeana, Ohio, in Butler County. Marker is on Okeana-Drewersburg Road 0.1 miles west of Cincinnati-Brookville Road (Ohio Route 126), on the right when traveling west. Touch for map. Marker is opposite Okeana United Methodist Church. Marker is at or near this postal address: 6464 Okeana-Drewersburg Road, Okeana OH 45053, United States of America. Touch for directions. (approx. 2½ miles away); Paddy's Run (approx. 3.2 miles away); Snow Hill Covered Bridge (approx. 4.8 miles away in Indiana); Bunker Hill / Dog Town (approx. 5.3 miles away); Bunker Hill Universalist Church/Bunker Hill Cemetery (approx. 5.3 miles away); Bethel Chapel (approx. 5.7 miles away); Bethel Chapel 1815- 1873 (approx. 5.7 miles away). Touch for a list and map of all markers in Okeana. Across street from township house. More. 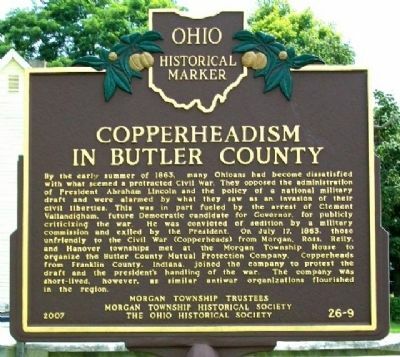 Search the internet for 1858 Morgan Township House / Copperheadism in Butler County. Credits. This page was last revised on June 16, 2016. This page originally submitted on November 2, 2009, by William Fischer, Jr. of Scranton, Pennsylvania. This page has been viewed 1,424 times since then and 8 times this year. Photos: 1, 2, 3, 4. submitted on November 2, 2009, by William Fischer, Jr. of Scranton, Pennsylvania.